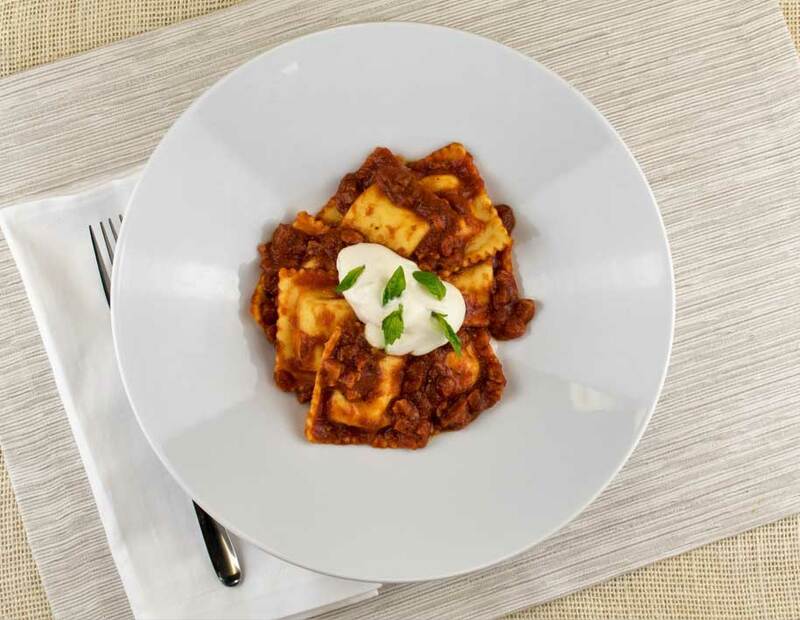 This delicious recipe is an instant classic sure to make the family smile at dinner time. It marries classic Perfect Pasta Cheese Ravioli with a garlic eggplant pomodoro sauce, and tops the dish off with a dollop of soft Stracciatella cheese. Buon Appetito! Heat extra-virgin olive oil in a large skillet over medium-low heat. Add eggplant, onion and garlic, and cook, stirring, until soft. Add crushed red pepper flakes, salt and pepper to taste; cook for 1 minute more. Increase heat to medium, add crushed tomatoes, and cook, stirring occasionally, until sauce thickens slightly. Remove pan from heat, stir in basil and set aside. Meanwhile, bring 6 cups of salted water to a boil in a large pot. Add Perfect Pasta Cheese Ravioli and cook for 5-6 minutes. Drain the ravioli and add to the eggplant Pomodoro sauce. Plate the ravioli and top with a large dollop of Stracciatella cheese in the center. Garnish with extra chopped basil and parmesan cheese. Get our latest recipes, learn about our newest events, and stay connected.